I mentionned it before, i find that mountains can be boring to view when there's no patches of grass or snow. I played again with superposed texture over screenshot. I don't know, it seems to me that by adding an extra procedural texture (could just be a slightly darker color), the same way as grass or snow, it could could fake geologic formation. I really dont know how the procedural texture are done but it could look like a motif projected horizontally on vertical faces. Again it would not be to recreate realistic feature of specific region, but just to add depth with some generic rocky motif. I wanted to use real rock patterns together with lithological maps to get the right shapes here, but the problem thus far is how to generate the uv texture coordinates from the arbitrary terrain data. Wouldn't there be some "volume-based" approach possible ? .... i mean, if ya even slap a texture on it, craters or potentially, digging holes in future would probably mess things up unrealistically. I thought some way of going from the lithological map as base info of types of minerals with-in the region, just generating some random, maybe even, local height-dependent layers witch would be projected upon the terrain with additional "mineral-textures". The idea in my view was, like if ya see some army vehicles camouflage pattern, and you would try to imagine/compute some imaginary regions for all the colors with-in the vehicles volume - (kinda like a "CT-slicing" the vehicle, but not for seeing the internals, but an imaginary color/pattern extrusion into the vehicles volume). Doe it would be just used on the places where there imaginary regions have contact white the terrain surface and apply at each of those the right mineral textures. Thing is, these generated imaginary regions would be practically there from say -100 meters to 6 Km altitude for the whole earth and if ya would make some new mountain with a terrain-editor, it would fill it in, just like if ya dig a deep hole in the mountain. For some special imaging purposes (i can image some resource-based game trying to do this) these regions could be maybe visualized also, just like the terrain data, but in some slightly transparent ways and selectable for each mineral type to be visualized (aether the whole terrain data - from -100m to 6 km anywhere or just regions being with-in the terrain). Not sure how that kind of "mineral layer generator" would be falling on performance, for a single mountain like that one, in its whole height. 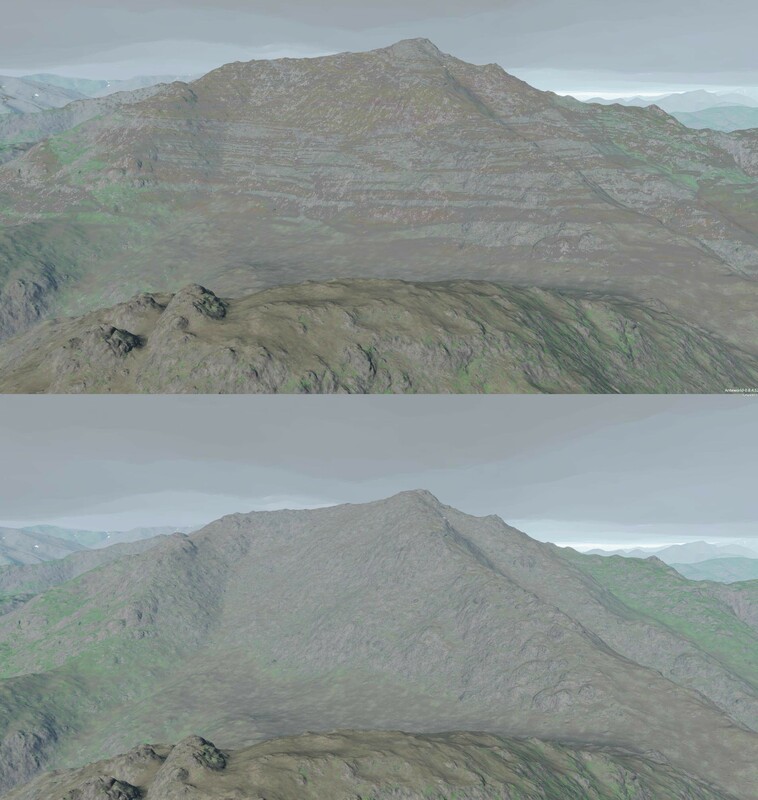 But there could be some LOD-like refining of the detail, like the surface bump-generation in the actual terrain. That's where I'm with it now, something volumetric but projecting it to the surface, since everything is modeled as surfaces, as are the usable data. But that makes it harder to control, compared to providing textures and displacement maps made from photos. Would be posible to refine the image texture from 500 m to 100 m, so the original texture create all the colour richness and being accurate with the real world? (also the image need to have this real color reachness, not only being bigger). I dont know if its posible to find a source with that kind of pic (with cicies masked like the actual 500 m used in outerra). The problem with the actual texture is loose all the detail. If we can have more detail, then the actual rock and terrain textures can follow those colors and we can see a rich color world. Even you can add more textures matching with more diferent colors. Working in adding the textures by color, or by geological data if avaiable. or a mix. This is the challenge for outerra. If you get the engine able to work with really high detailed base pics and cover them with your refined textures (acquiring the terrain color) and adding more textures and fractal types, then this will be historic. Its probably half of game programming. Ha! M7 you really had me fooled for a second there. I thought the mountains got a texture update I didn't know about.